That is a long f**king title! Anyway, before I decided to review this game, I had never watched a single episode of Naruto in my life. That might seem odd to you, but I get bored easily and I’ll play anything once. With that in mind, I found the first ten or so episodes of the show online and watched away. 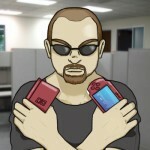 I must say I rather like the show now, and the game was a welcome addition to my massive collection of PSP games. Ninja Heroes 2 is a fighting game based on the ridiculously popular anime. It offers a brand new storyline and plenty of portable action. Licensed games are always hit and miss, but a lot of these anime based fighting games turn out to be decent. Does this one manage at least that, or does it drop out of ninja school due to gross incompetence? You might be surprised to learn that UNH2 doesn’t follow the old standby of mimicking a story from the anime. Instead, it offers a brand new chapter in the Naruto universe, albeit one that stands alone and will undoubtedly never be mentioned in the show. You play as, you guessed it, Naruto. While on a mission with two of his ninja buddies, they discover a strange castle has appeared in their village. When they get back, they discover that the castle, Mujenjo, is steadily sucking the life out of the town’s residents. Naruto wastes no time in rushing headlong into the castle alone. Eventually, his friends and allies start showing up two by two to join his party. The goal is to destroy eight seals that hold the ghost castle together, and to locate the Princess of Dusk, who is supposedly behind this whole thing. What follows is overly predictable and has little ambition, but gets the job done. Most of the characters feel like they were thrown in to make fans smile, as they have all of five lines in the entire game. Still, as a piece of fan service, Naruto is *ahem* serviceable. The story is played out with you slowly making your way up the 100 levels of the castle. Each floor has several rooms that you’ll need to travel through in order to reach the next set of stairs. The big twist here is that the castle is shapeless, meaning the rooms are empty space. You’re given scrolls that will fill in the gaps with whatever room you desire. You’ve got battle, amusement, clone, shadow clone, tree climbing, and riddle. Battle is pretty self explanatory. Amusement tasks you with playing a slot machine that almost never works; clone is a simple hide the ball under a cup, spin them around, and pick which cup the ball is under; shadow clone is Simon for beginners, riddle asks you questions about the show; and tree climbing test your ability to pick up speed boosts while avoiding tree trunks. These are all amusing at first, but throughout the game’s 100 floors, you’re bound to get bored of them all. Each character in your party has skills they can use to ease your journey. Some have abilities that clear obstacles or find pathways that lead to treasure rooms. You can choose to save them in order to create shortcuts to the staircase. This creates a decision you’ll have to make as to what is more important to you. Other skills are focused on healing your core team of four, which are the only ones you can use in battle, and switching out what scrolls you have available. By the end, you’ll be able to manipulate your pool of scrolls so that you never have to play a minigame you don’t want to or avoid battles. Of course, there are rooms dedicated to advancing the story that have battles in them, so you’re not completely off the hook. Finally, there are healing rooms which restores all health, chakra, and skills. It also allows you change your party. Whomever you chose, you’ll still be able to use everyone’s skills, just not battle with them. It has a tendency to drag on after the first few dozen levels or so, but the story mode is pretty unique among fighting games. It almost feels like an rpg, especially when you find items to increase your stats. It might not be better than your typical fighting game where you fight through with each character to unlock an ending, but at least it is different. Fans should be pleased. The goal of any anime game should be to mimic the look and feel of the show. UNH2 succeeds here with bright cell shaded characters that are animated nicely and are pretty well detailed. For instance, Naruto attacks using his Shadow Replication jutsu, and watching his clones roll forward and pummel your enemies is extremely satisfying. Using the Ultimate Jutsu moves results in a small cutscene that never fails to be impressive, no matter how many times you see it. Seriously, watching Inner Sakura smash your opponent into the ground is just good times. What really impresses me is how well the games hold together while dealing with the frenzied speeds of the combat. I noticed only really small frame rate dips during the craziest moments. 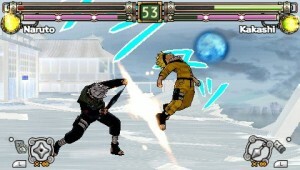 For a fighting game, this kind of thing is necessary, and Naruto delivers. There are a few small complaints. Any time you move to the background, the characters get really small and it becomes difficult to see what’s going on. During story mode, all you get is static character portraits with a total of three or four actual cutscenes throughout the whole experience. Still, the game flat out looks great on the PSP. You have a choice to make. Depending on that choice, your experience as far as sound goes will either be good, or very very bad. If you haven’t guessed, that decision is whether you use the Japanese or American voice tracks. The American is just plain awful. The characters are loud, obnoxious, and make me want to strangle them with their own head protectors. They pronounced chakra as “chalkra” once. I almost screamed. During battle, any time you get chakra or health, you’ll hear the same line repeated over and over. “I got my chakra back.” “I got my health back.” I didn’t play this game for more than an hour with the American voices. I just couldn’t do that to my ears anymore. The Japanese track is much better. The voices actually fit the characters, and those silly one liners are much easier on the ears. You’ll still have subtitles in English for the story, so there’s no reason for you not to switch over. The music is your typical Asian flare. I couldn’t place any of the tunes as being from the show, but I’m pretty new to it, so maybe I just didn’t catch it. I don’t hear the theme song anywhere, which is a shame. I really like that one. The music is pretty forgettable, but never offensive. The sound can get a little chaotic during battle. You have characters yelling, shurikens flying, bombs exploding, and anything else you can think of. This works wonders for the game, as it really helps amp up the excitement of each battle. I don’t know how intentional it all was, but I loved it all. When you get down to it, UH2 is a fast paced fighting game. That’s how it should be. You move with the directional pad, block with the R button, and strike with the circle. Square throws your shurikens and any other weapons you pick up, X jumps, and triangle surrounds you with enough chakra to perform your ultimate jutsu move. The idea here is to hit massive combos on your opponent while maintaining your chakra, which is kept track of by a bar under your health. 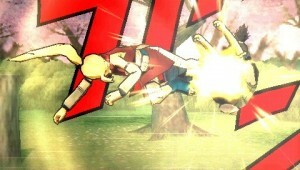 Chakra allows you to perform special moves and teleport behind your opponent. The latter of these has to be timed with their attack, but once you’ve got it down, it is pretty easy to pull off. If you have max chakra, then you can press triangle to build it up around you. If you land a hit during the two or three seconds it’s activated, you’ll perform your ultimate jutsu move, which delivers massive damage and gives you a temporary boost. These had the potential to be game breakers, but they’re not as easy to pull off as they sound. 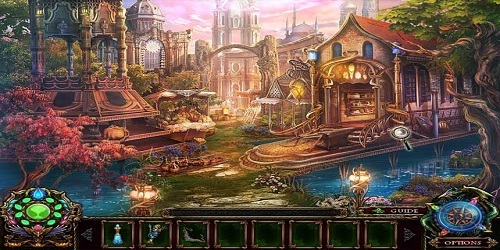 The levels are pretty large, and feature a foreground and background. You can push up or down along with the jump button to switch between these. The benefit is a chance to get away from your opponent for a few seconds, or even to grab a few items to toss at your opponent. Some characters have the ability to heal themselves at the expense of chakra by holding up on the d-pad. It will use up chakra, and they are prone to attack the whole time, however. Likewise, any character can regain chakra by holding down or by collecting orbs that appear whenever you knock an enemy down. The best ability you can learn it to double tap X in order to shoot off over to your opponent. 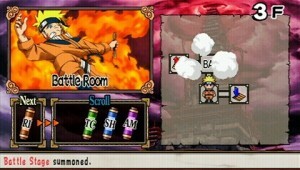 This can lead to a good combo, as well as keep your opponent from getting enough time to recover chakra/and or health. More importantly, it keeps the pace of the game up to intense levels, with dozens of blows flying every few seconds. The game takes some pretty fast reflexes. At times, the game feels more like a refined version of Super Smash Brothers. You smash away with one attack button that can be strung into combos using the directional pads, and gather items to toss that cause serious damage. (Shurikens are pretty useless though) The game controls smoothly and is extremely accessible. Just don’t expect button mashing to get you anywhere. You’ll only have three real modes of battle though. Vs cpu is pretty explanatory. 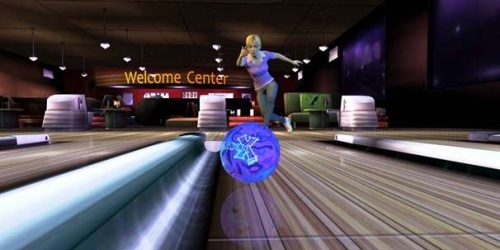 Wireless mode allows you to play against another person ad hoc only, although game sharing is featured, so you’ll only need one copy of the game. (Always nice.) The other mode is heroes mode, which tasks you to create a team of three in order to run a gauntlet of five other teams. Your character’s health will carry between battles, granting you a small amount of life in between. It is like a combination of survival and team battle from the Tekken series. At the very least, it offers a hefty challenge. This game may not have a lot of depth, but the fast pace and fun factor are more than enough reason to play. With over twenty characters to choose from, there is someone for everyone to use. Here’s one of the few snags the game hits. For one, the story mode gets really old by the time you end it. I wouldn’t want to play it again. You do unlock a second story mode, but it is much shorter and still sends you through the dungeon crawl. I may not be the best person to judge the balance of a fighting game. I’m the guy you play against that always rushes forward while mashing the attack buttons and never using block. No, it never works. Still, let’s give it a go. As far as the story mode goes, it is pretty easy for the large part of the game. Using the scrolls, you can avoid most battles. All of the other rooms you create offer no penalty if you lose. You’ll still be able to move forward. When you do battle, you’ll notice a steady increase in the abilities of the computer AI. Plus, they start getting stat bonuses such as attack, defense, and speed up. You’ll need some pretty good reflexes to survive towards the end. As far as balance among the characters goes, there are several that just feel stronger. Kiba, for instance, feels like he can tear anyone to shreds, but whenever I used Naruto it was like I couldn’t land a hit half the time. Naruto does have some stronger special attacks though. Every character uses the same control scheme, so it is pretty easy to pick up and play as any character. I was pretty pleased with the balance overall. 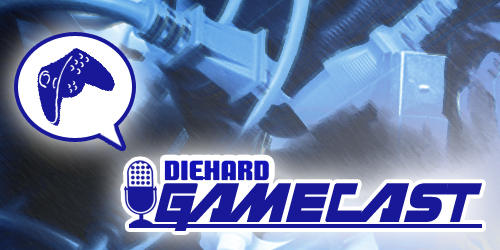 We’re talking about a sequel to an anime inspired fighting game. Naruto’s games have no lack of experience as far as that goes. 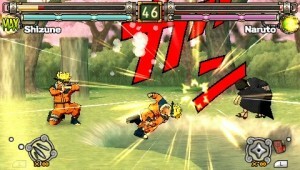 The fighting style is nearly identical to the first game, and the modes offer little new. Story mode is where the originality of the game comes through. I’ve seen story modes in fighting games that require you to navigate a map before. Soul Calibur started that trend. However, the sheer customability and length of the dungeon crawling aspect of the game is something I’ve never seen before. You have a choice as to what challenges you take. You can use your skills to find secrets and make shortcuts. I wish more fighting games had this kind of an approach to the story. 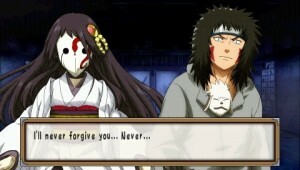 Maybe it was because I was new to whole Naruto universe, but I couldn’t stop playing this game. I played through the whole thing in only a couple of days, and that was while I was out doing my normal life things. I was playing at dinner, at the theatre, in the car, in my room, at my parent’s house, and everywhere else I went. I just couldn’t wait for the next battle, the next character to play with. It is true that the end of the game drags, and that going through one hundred floors can take a toll on you. I’m sure anybody else would have been hard pressed to continue on, but not me. Even when I had been playing for hours and hours, I played for hours more. Hell, I got the game on Saturday along with Arkanoid DS, and then Space Invaders for the PSP and Guitar Hero: Aerosmith for the PS2. I ignored them all, even though only a week before I would have played them all three times over before I even thought of playing a Naruto game. I love how life works like that sometimes. Naruto is the flavor of the month anime so to speak. We had Dragonball Z, then Yugi-Oh, Inuyasha, and now Naruto. It seems there is rarely enough room for more than one anime to be big here in the US. I’m sure this game will have no problem finding an audience amongst fans. Of course, nobody but me buys PSP games it seems, so I don’t expect it to sell much. This game is a near perfect portable title. No battle or side mission will ever take you more than a minute or two to finish. Load times are brief. The PSP’s power save feature works better than ever, with zero delay between you turning on the system and being able to play the game. This is the kind of game you pull out when you’re stuck in line at the movie theatre or stuck on the phone with your mother and she’s rambling on. Good times were had by all. I would have like to have seen more modes here though. Where is time attack, survival, and hell, even practice mode? This game could have been the complete package, but manages to feel like its missing something instead. Thank god for the Japanese voice track. It can’t be said enough. Before this game, I was the furthest from being a fan of Naruto as you can possibly be. After about a dozen episodes and the experience I had with this game, I think it is safe to say I’m hooked. Ultimate Ninja Heroes 2 features a great presentation with simple yet fun gameplay and a unique look at story modes in fighting games. I urge anyone with a PSP to give this a try. It may not be on the same level as Tekken Dark Resurrection, but it is still one of the better fighting games you can get on go. If you mean off of PSN, I don’t believe so. Otherwise you can probably find it for less than twenty dollars used.